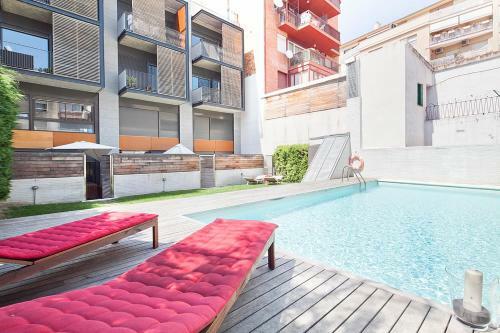 Offering a shared outdoor swimming pool and furnished garden terrace, Pool Garden Apartments are located in the Sarrià-Sant Gervasi neighbourhood of Barcelona. These modern, air-conditioned apartments feature functional décor throughout. Each one has a lounge with leather sofas and a TV, as well as a spacious terrace. The modern kitchens have a hob, oven, microwave and coffee maker. They also come with a dishwasher and washing machine. The charming Gràcia district is approximately 10-15 minutes’ walk from Pool Garden Apartments, depending on the particular apartment. The nearby Lesseps Metro is just 4 stops from Plaça Catalunya Square, where there is a regular airport bus service. Please note that check-in takes place from 15:00 to 20:00 at the office located on Prats de Molló Street, 14, Barcelona 08021. Check ins after 20:00 carry a surcharge of € 40, while arrivals after 23:00 carry a surcharge of € 50. All late check-ins take place directly at the apartment. Please note that check-in before 15:00 is available upon request and carries a surcharge of € 40. Please note that the standard cleaning fee of € 60 is for a final cleaning service after departure. Address: Ballester, 46 This duplex apartment features 3 bedrooms, 2 bathrooms and a furnished terrace with a washing machine and tumble dryer. Free Wi-Fi and air conditioning are included. There is a living-dining area with a TV and sofa bed. The kitchen includes an oven, hob, microwave and coffee maker. Rate: € 117.00 ... € 315.90; select dates below to get current rates.